Woohoo, can't wait to see YanZi again! Going there to probably meet the YanZi Unlimited people at 2 PM ... XD. Rain or shine, i'll be there. Held at the Padang and open to and free for everyone, the concert is expected to entertain more than 20,000 people, including workers, youths and families, from all walks of life and ages. It will be an exhilarating evening for all as we celebrate our local talents, whom we wish will inspire hope for a brighter future for many more among the audience. A delayed television broadcast of the concert on MediaCorp TV Channel 8 on May Day afternoon (1.30 pm) will beam joyous moments of the concert to the television sets of many workers and Singaporeans. 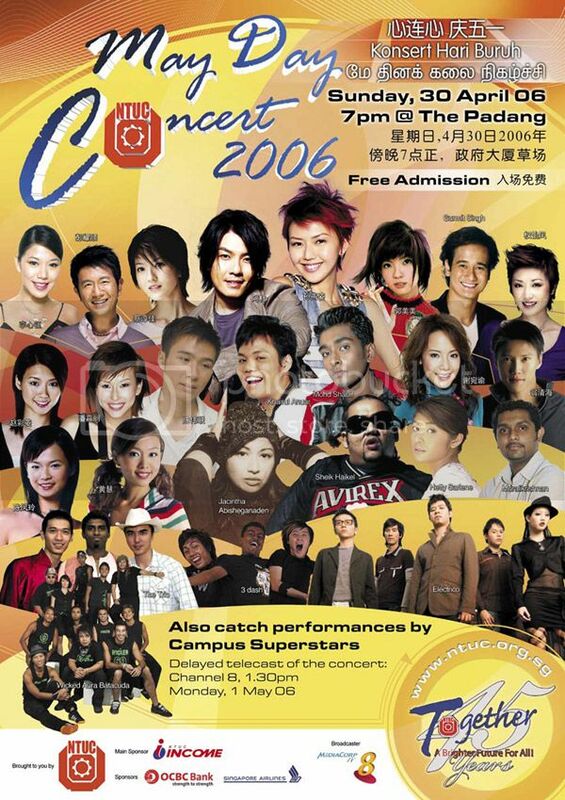 Featuring all-Singaporean and multi-racial stars like Stefanie Sun, A-Do, Jacintha Abisheganaden , Hetty Sarlene, Muralikrishnan, Khairul Anuar (Anugerah Champion), Shabir (Vasantham Star Champion) and Tan Wei Lian (Project Superstar Champion), the May Day Concert 2006, promises to be a star-studded, multi-cultural and fun-filled three-hour extravaganza. Oh, it's on today's Straits Time LIFE! section too XD. LoL, YanZi's indeed an International Superstar, audience can SMS song requests at the start of the concert for YanZi to perform ... SO COOL!!! Others don't have LOL. I'm so gonna request 'Wo Bu Nan Guo', my fave track of all time XD. Maybe 'Green Light' too ... cos it's catchy kyaahhhh~ Can't wait for tomorrow =]. hey there! I'm going too...gotta let myself go sometimes...glad to find another yz fan! Cheers! yep yep, relax and let go, YanZi rulez! XD.